Pacific Coast Entertainment brought the party to Tilly's annual employee party.COSTA MESA, CA--Nationwide clothing retailer Tilly's called upon PCE for their annual employee party. A 300 foot Orange County Fairgrounds hall was filled with 1000 feet of truss and a list of lighting and video equipment nearly as long. PCE event designer Braedy Benjamins used moving lights, Elation's LED Design Bricks, 42 inch plasma monitors, video projectors, and over 220 Source 4 PARS to illuminate and define distinct areas for the event. Technical highlights include shooting guests' still image at the entrance and instantly showing them on monitors inside the venue, 80s era music videos playing on screens flanking their 'Punk Rock Cafe', and moving lights projected on holographic curtains behind 80s cover band Power Surge's performance stage. 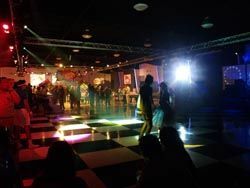 Tilly's CEO was heard saying, "This is the best party we have ever had; PCE did a great job!"